FORMER CROWDED HOUSE drummer PAUL HESTER was a guest artist on their latest CD TOOT TOOT and they can pack out two Newcastle Entertainment Centres at the drop of a hat. They are THE WIGGLES, and this Friday's concerts, at 10am and 12.30pm at the Newcastle Entertainment Centre, will feature an arrival of the BIG RED CAR and a cast of colourful characters. For the past seven years The Wiggles have been singing memorable songs such as HOT POTATO and FRUIT SALAD, providing positive messages to catchy music. 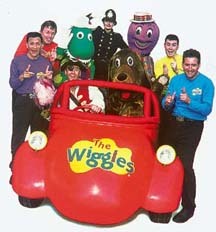 Topics such as road safety, our own bodies, musical concepts and songs that are just good clean fun are Wiggles staples. Characters such as DOROTHY THE DINOSAUR, HENRY THE OCTOPUS, WAGS THE DOG and CAPTAIN FEATHERSWORD, have helped the wholesome foursome sell 1.6million videos and 800,000 recordings. All members of The Wiggles are accomplished musicians with ANTHONY FIELD and JEFF FATT having tasted Top 10 success with THE COCKROACHES. Three of The Wiggles are graduates from the Institute of Early Childhood Studies at Macquarie University. Guitarist MURRAY COOK says the band's training has made each aware 'how children can learn and develop through musical concepts'. The Wiggles started as much for the members' fun as for the delight of their audiences. 'There's no cynicism with very young children,' Murray said. TE has a boy's and girl's Wiggles TURNING POINT clothing pack, each containing WIGGLES GROSBY shoes to give away.